The Hotel Stocktonwas not the result of government action or big business funding, but was conceived by a small group of citizens in 1903, who raised the money themselves, to create something notable and lasting. 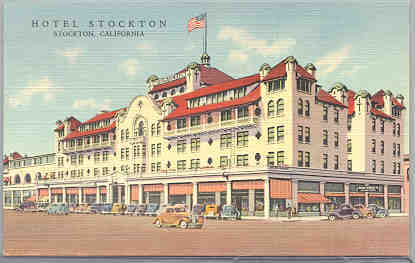 They recognized that without a fine hotel, Stockton could not compete for out-of-town business and tourists. The initial budget of $350,000 was raised by public subscription, with the promise of a 6% return. Within a month, nearly $300,000 was raised, an enormous sum at a time when the average annual salary for workers was only $750! The building was Design by local architect Edgar Brown to cover a full city block. Construction, which began in earnest in 1908, had its own challenges, from the need for deep piles due to the waterfront location, to having the original contractor go bankrupt. Finally, the Hotel did open to great acclaim. This grand result of their efforts was completed in 1910 as a 252 room tourist hotel, just a year after the great San Francisco earthquake. 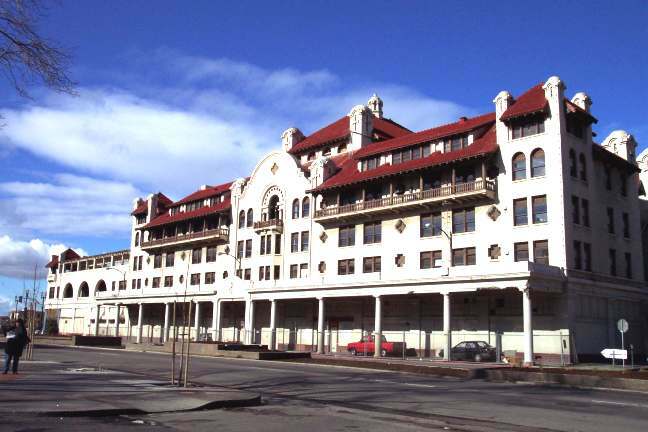 The Hotel's facade, particularly its roof line, is a large and prominent example of the Mission Revival style. It is six stories plus a basement in height, with over 145,000 square feet. It was the first reinforced concrete "fireproof" building in the Central Valley. Other innovations were refrigerated air, a built-in vacuum system, private telephones, hot/ cold water, steam heat, and private lavatories. A large ballroom was on the top floor. The third floor housed a 10,000sq.ft. outdoor terrace surrounded by an elegant pergola, tropical plants, and a fountain which overlooked the deep water channel. The ground floor had shops, a grand lobby, and a popular grill. It was the original home of City Hall until the current City Hall was opened in 1926. Theater luminaries of the day, including Lillian Russell, Sarah Bernhardt, John Drew and David Warfield were early guests, and in 1941, the Best Picture winner, AAll the King=s Men,was filmed there. It was a popular spot for special events for local residents: weddings, anniversaries, graduations and more had it full and hopping for decades. The Hotel struggled to survive during the 1940's and 1950's, and it finally closed to guests in 1960.That year, San Joaquin County offices moved in. The decline of AThe Stockton@ was progressing rapidly. Many historic interior spaces were gutted for offices and partitions. The building began to lose its luster and ended up a blight in downtown Stockton. Placed on the National Historic Register in 1981, this did little to turn the tide. County offices moved out in 1991, and, with the exception of a few small businesses, the building sat mostly abandoned until a series of efforts to secure financing and save the structure were successful in 2001. A series of efforts by many people over the next decade finally resulted in a plan to save the building. Milford Wayne Donaldson FAIA was one of the architects involved along the way in a project that was to convert it into offices; this project was unable to move forward due to financial issues. Invited to look at the potential of the forlorn building in 2003, Cyrus Youssefi's CFY Development, Inc., along with Architect Michael F. Malinowski, AIA, of Applied Architecture, Inc., started the immense task of saving the building and bringing it back to life as a mixed-use development incorporating apartments, restaurants, offices and shops. This effort involved the dedication of literally hundreds of people from all walks of life. The apartment phase of the adaptive reuse was completed in 2004, with the commercial ground level work continuing. The Stockton has become a lasting and living tribute to the vision, spirit and determination of the citizens of Stockton once again. The project consisted of a mixed use development incorporating apartments and future ground floor retail and restaurant uses. An historic rooftop terrace overlooking the channel and waterfront square has become a public space once again, connected to a ground floor restaurant. The adaptive reuse and rehabilitation of the Hotel Stockton is a proposal which was carefully and delicately balanced program that created feasibility of what was by all accounts a very challenging undertaking, both programmatically, technically and most of all financially. The project received funding from the California Tax Credit Allocation Committee, the Federal Historic Tax Credit, the City of Stockton, and private investments. The upper floors now provide 156 apartments for low and fixed-income residents, with units ranging from 245 to just under 500 square feet. Many units have unique architectural characteristics and views. The historic rooftop terrace overlooking the deep water channel and DeCarli Square, has already played host to several events and received rave reviews. The ground floor already multiple tenants, which included offices of Congressman Cordoza at completion. As completed, the development rehabilitated an important City historic resource, provides comfortable and safe housing, provides for retail and restaurant uses that enhance activity on the street and complements the adjacent multi screen seat state-of-the-art cinema complex, and provides a major boost in the ongoing efforts to revitalize downtown Stockton. The Stockton once again inspires, delights, and provide useful functions to the city and it's citizens.